John Kelly knows a thing or two about running the Barkley Marathons. In 2017, he became just the 15th person in the race’s history to even finish. For the 2018 edition of the Barkley, Kelly came back to the woods in the Tennessee mountains, but opted to help other runners, instead of competing. 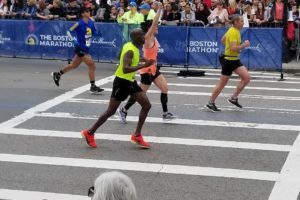 He also provided an intimate view of his experience, bringing along a GoPro as he went onto the course, even in the middle of the night (and some of the fiercest weather in the history of the event). Kelly, who is originally from the area around Frozen Head State Park, where the Barkley takes place each spring, came back for the 2018 race to help crew two runners: Canadians Jodie Isenor and Gary Robbins. Of course, all eyes were on Robbins, as he attempted to finish the course, after two increasingly dramatic failed attempts in 2016 and last year. Robbins, and all other runners, were defeated by the course this year.